Samori Touré: African Leader and Resistant to French Imperialism! One of the great kings, and fighters of African freedom was the great Samori Touré. 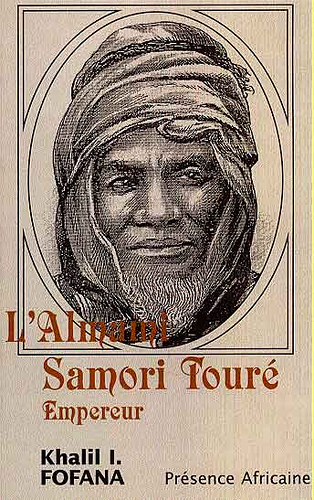 Over 100 years ago, Samori Touré was captured by the French and deported to Gabon where he died of pneumonia. But who was Samori Touré? Well, Samori Touré was born in 1830 in Manyambaladugu (some texts mention Sanankoro instead), a village southeast of Kankan in present-day Guinea. Samori was a great warrior who fought imperialism in the 19th century such as many leaders today. He refused to submit to French colonization and thus chose the path of confrontation using warfare and diplomacy. Until the age of 20, Samori was a trader. After his mother was captured in a slave raid by the king Sori Birama, he offered to serve in his army and excelled by his military prowess and skills. Samori Touré had a vision of unity for the Malinké people, and thus started organizing his empire using traditional and innovative methods. He effectively organized Malinké chiefdoms into a single state under his authority, at the core of which was the army. He managed to increase loyalty to the state in the Malinké people who now thought as one united people… this intensified their allegiance to him. His state was well-organized and efficient. Samori’s army was powerful, disciplined, professional, and trained in modern day warfare. They were equipped with European guns. The army was divided into two flanks, the infantry or sofa, with 30,000 to 35,000 men, and the cavalry or sere of 3,000 men. Each wind was further subdivided into permanent units, fostering camaraderie among members and loyalty to both the local leaders and Samori himself. Talk about African organization and discipline… this was really a strong army! His empire reached his apogee between 1883 and 1887, and he took the title of Almami or religious leader of a Muslim empire. Samori Touré created the Mandinka empire (the Wassoulou empire) between 1852 and 1882. His empire extended to the east as far as Sikasso (present-day Mali), to the west up to the Fouta Djallon empire (middle of modern day Guinea), to the north from Kankan to Bamako (in Mali); to the south, down to the borders of present-day Sierra Leone, Liberia, and Cote d’Ivoire. His capital was Bisandugu, in present day Gambia. In the 1850s, slavery being abolished, European powers decided to establish colonies in Africa, and could not tolerate strong states like the Mandinka empire, and strong leaders like Samori Touré. These African leaders had to be crushed! In 1882, at the height of the Mandinka empire, the French accused Samori Touré of refusing to comply to their order to withdraw from an important market center, Kenyeran (his army had blockaded the market). They thus started war on him. This was an excuse to start war! From 1882 to 1885, Samori fought the French and had to sign infamous treaties in 1886 and then 1887. In 1888, he took up arms again when the French reneged on the treaty by attempting to foster rebellion within his empire. He defeated the French several time between 1885 and 1889. After several confrontations, he concluded several treaties with the French in 1889. In 1890, he reorganized his army, and signed a treaty with the British in Sierra Leone, where he obtained modern weapons. He re-organized his army so as to stress defense, and employed guerilla tactics. In December 1891, French forces overran the major cities of the Mandinka empire, leaving death and desolation in their wake (sounds familiar? Côte d’Ivoire April 2011). These incursions into Touré’s empire led to exodus of the entire nation eastward. In 1893, Samori moved his capital east from Bisandugu to Dabakala. 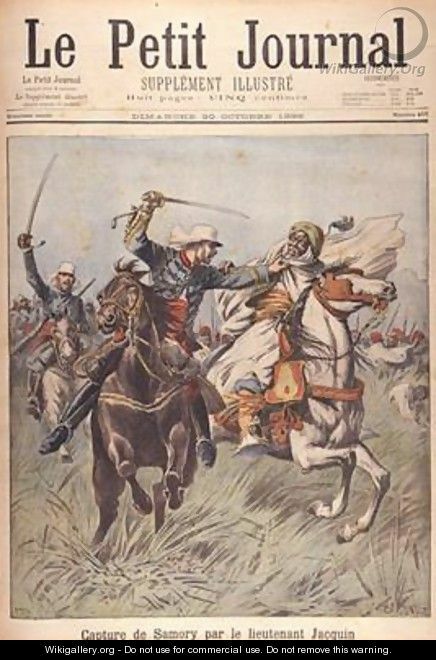 In 1894, the French assembled all their troops in western sudan (Senegal, Mali, Niger, etc…) to fight Samori. Between 1893 and 1898, Samori’s army retreated eastward, toward the Bandama and Como (in modern day Cote d’Ivoire), conquering huge territories in the northern part of modern-day Cote d’ivoire. He led the scorched earth tactic, destroying every piece of land he evacuated. Although that tactic cut him from his new source of weapons in Liberia, he still managed to delay the French. He formed a second empire, and moved his capital to Kong, in upper Cote d’Ivoire. On May 1, 1898, the French seized the town of Sikasso and his army took up positions in the Liberian forests to resist a second invasion. This time Samori’s army fought valiantly but was no match to the power of the French arsenal. Samori forced to fight a total war against a foreign invader, and fighting against all odds, was captured on September 29, 1898, in his camp in Gué(lé)mou in present-day Côte d’Ivoire. He was exiled to Gabon where he died two years later on June 2, 1900. Samori Touré was a warrior, a fighter, an empire builder, and one of the greatest African military leaders ever seen… he fought and won against the French army several times before his capture. Interestingly enough, over 50 years later, the grandson of Samori, Sekou Touré, was the only one to say ‘NO’ to France, and to General De Gaulle: they preferred freedom over slavery under the European master… that was in Guinea! Please check out the work of Pr. Yves Person on WebMande.net who wrote a book on Samori Touré, BlackHistoryPages, and this article published by the New York Times in 1898 about the Capture of Samori Toure by the French. According to the New York Times, Samori, “for nearly 13 years, was the most dangerous antagonists Europeans had had to deal with“. I could not find a good map of Samori’s empire anywhere… so I made my own based on all the boundaries and main cities conquered and his capitals: Bisandougou, Kankan, Bamako, Sikasso, Kong, Dabakala, Guelemou, etc… some of the cities may not be the same today (or even exist after 100 years), particularly the city of Dabadugu: Samori Toure defeated the French at Dabadugu, was it the city of Dabadugu near Kankan, or was it the city of Dabadugu near Nzerekore? I used Google map and made my own, respecting all the information found in all the different books and atlases I read. This is the entire kingdom, without taking into account the first and second empires. If you have further information, I will be happy to hear more. This is the right weblog for anyone who wants to seek out out about this topic. You notice so much its almost onerous to argue with you (not that I actually would need…HaHa). You undoubtedly put a new spin on a topic thats been written about for years. Nice stuff, simply great! Thank you for your compliment and also for pointing out what could be improved. The subject of why Samori lost the war and failed against the French will then be the subject for another post. What is refreshing about this piece is presenting the story from an African perspective. Good job! is great , A great leader. my name is Yusupha Camara. thank you for this stuff it really helped me. Thank you for visiting my blog. I am glad you appreciated this article on Samori Toure. I am glad it could be of help to you, for your assignments. thank uw so much fo the effort……….,.,. a truly great piece however mre required on tactics used by samori in defending mandinka during the eight yearwar othawise gd job! i found dis piece helpful in treating Toure as a pre-colonial african personality. This is the greatest leap in African Historiography. This is the aspect of History that I call OUR OWN. It is a representation of our very selves from our own perspective. Samori was one of the best patriot, nationalist, warrior during his time. We cannot find any leader of his type today in Africa. So well described. I had learnt about this great man in school and was admirative. Ur full story here gives me even more details and conforts me in my praise. More interestingly just discovered the fact on Sékou Touré, just amazing. Thanks to keep the spirit alive!!! was this samori of a man got no name, did his parent name him samori????????????? Of course, his name was Samori! His grandson was Sekou Toure. A very good fact for those seeking imformation. wow!it`s been enjoyable reading this article.Samori was a great man indeed. Hі there, I enjoy reading all of your article. I աanted to write а little comment tо support ʏօu. Samori was a great African warrior lived for the defense and welfare of his people. Am proud of his determination in fighting against French colonizers.This is what African leaders should emulate. Totally agree with you. I wish we had more leaders like that today. I disagree with you, especially given that Yaya Jammeh has not spoken against imperialistic forces attacks in neighboring countries in Africa. In most cases, he has even applauded those. I wish they would teach this history in our schools. It’s an honor to be named after this great man. Yes indeed! I totally agree with you Samouri! and it is quite an honor to be named after such a great man. thats gud love to chat with u on facebook nd 2go. i wish i was in the olden days i féel so bitter about it..
Don’t … you are living now, and your work is for humanity… so do your best to make this era better, do your best to empower others, do your best. thanks for making the world no him first, this generation will know this great man too, I m proud becuses him is mendingo I m mendingo too. Yes Musa, we should all be proud of Thomas Sankara, for his work was for humanity, and continues to work millions across the globe. Samori was indeed a powerful ruler in His time and I loved His resistance since he was a man of his words. I love you Samori. Thanks for your comment Passy. Yes… Samori Toure was a great and powerful ruler. You should definitely read the book by Pr. Yves Person. It is very detailed. Reblogged this on Tekpwfari Stix El Ra. It’s amazing learning about these African heroes. I can say I’ve been learning more about African history through your blog than what I experienced when I was in school. Thank you for the compliment Ospreyshire! You’re certainly welcome, Dr. Y. I’ve been learning a lot from you.